Coach Julian Cochran returns all but three players from 2017 and is primed for what he thinks can be a special season with a great core of veteran leaders. The Cavaliers are 2–1 on the young season and already have a signature win, a penalty kick shootout victory over Fayetteville Academy, last year’s N.C. Independent Schools Athletic Association 2A state champion. Combine that with Tuesday’s 5–0 shutout over previously unbeaten Riverside High School, and Coach Cochran’s team is off to a flying start. With a balanced Triangle Independent Schools Athletic Conference and NCISAA 4A this season, the Cavaliers should have a lot of competitive games — and with new state rules mandating that all games have a victor, that could mean more penalty kick shootouts in the team’s future. The Cavs’ lone loss on the season was a 2–1 defeat at Cannon School, last season’s NCISAA 3A state runner-up and a team that has already spent time this year in the national rankings. Leading the way on the field for DA will be a trio of senior captains: Roberto Escobar, Nick Epstein and Jack Horgan. All three have already made huge impacts in the young season. Escobar, the team’s goalkeeper, made two game-saving stops in the penalty kick shootout in Fayetteville and had a perfect second half in the win over Riverside. Epstein scored on a great individual effort in the second half Tuesday night in the win over the Pirates, while Horgan has a goal and an assist on the year. Cochran is also excited about juniors Will Nichols, Tanner Barry, Ryan Kirschner and Crosby Williams, who should all have key roles on this year’s team. Nichols and Williams each have an assist on the season, and Kirschner (last year’s leading goal scorer) tallied the opening goal in the Riverside win. Barry’s play Tuesday night keyed a lot of the good things that happened on the field. Another junior, Isaiah Caldwell, put his name in lights Tuesday as he scored twice in the Riverside win. Coach Cochran believes that the “building blocks” are there, and he hopes that the team can come together quickly, as two big non-conference games loom before TISAC play begins. The Cavs will travel to Greensboro Day today to battle the Bengals in a big 4A contest before hosting 9–0 Cary Christian on Wednesday. Cochran and his squad have five goals this season that, if achieved, can help them win a league crown and compete for a state championship: “trust, consistency, passion/desire to win, effort/intensity and unity.” Nothing will challenge a team like having to play 100 minutes of scoreless soccer in the season opener against last year’s state champ and then go 10 rounds of penalty kicks. If the way the Cavs persevered through their season-opening win over Fayetteville Academy is any indication, this team is well on its way to achieving those goals. When legendary field hockey coach Judy Chandler says that she not only has the most difficult schedule in her coaching history but also her most inexperienced team, it is hard not to be impressed with the team’s 3–2 start. In fact, the Cavs have already avenged one of their two losses with a 1–0 win over Cary Christian on Tuesday and have taken defending state champ Charlotte Latin to overtime. Before conference play starts on Sept. 25, the Cavs will battle both Chapel Hill and East Chapel Hill high schools and Charlotte powerhouses Providence Day School, Charlotte Country Day School and Charlotte Latin. In the first five games of the season, DA has scored the first goal in each contest and has used the strong play of junior goalkeeper Victoria Lawton to limit opponents to just 1.8 goals per game. On the offensive end, sophomore Katherine Lantzy and eighth-grader Emilie Kirschner lead the Cavs with four goals each. Lantzy was named to the all-tournament team in Cary, while Kirschner scored the only goal in the Cavs’ win over Cary Christian on Tuesday. She leads the Cavs with 11 points (four goals and three assists). Juniors Hannah Grant and Caroline Sapir have proven to be extremely valuable early on, especially while the seniors were away at Senior Challenge. Grant had two goals and seven assists as a sophomore in 2017. Sapir, who played on the undefeated JV team in 2017, had a noteworthy game in the overtime loss to Charlotte Latin on Aug. 18. Another member of that JV team that has already made her mark is ninth-grader Emmie Savarino. Savarino is fourth on the team in scoring with two goals on the season. Robb was the team leader in goals and second in assists in 2017 and already has three goals and five assists. While West only had two assists a year ago, her toughness overshadows her numbers. The play of the Cavaliers’ field hockey squad in the first five games of the season should give the team confidence heading into the tough stretch ahead. Today’s matchup vs. Providence Day in Charlotte will be a big test for the Cavs, and a positive result will keep the confidence and momentum going for the young team. The girls tennis team received contributions from nine different players in a 9–0 win over Southlake Christian Academy of Huntersville on Wednesday. For the first time in almost two seasons, the Cavs swept all three doubles matches without losing a game. The first doubles team of junior Alexis Galloway and Madeline Towning; the second doubles team of senior Joy Callwood and junior Renee George; and the third doubles team of senior Julia King and junior Sarah Clark all won their matches 8–0. With Towning and Galloway having the day off, Callwood, George, Clark along with juniors Taylor Hunter and Isabella Strauss and sophomore Lucy Steiner all won their matches comfortably. 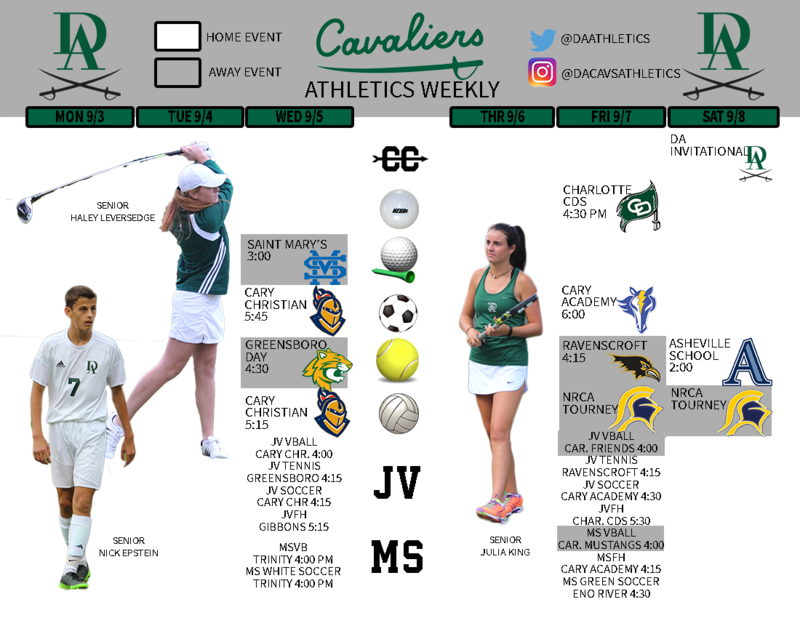 The Cavs are now 3–1 and have moved back into the top spot in the N.C. High School Tennis Coaches Association’s NCISAA 4A poll and remain at No. 5 in the High School OT area poll. Next up for the defending state champs will be their TISAC opener tomorrow at St. Mary’s before heading to Greensboro Day on Wednesday in a key 4A match against the Bengals. The volleyball team remains unbeaten after Wednesday’s 3–0 win over the Carolina Mustangs in the home-opener. The Cavs won by scores of 25–18, 25–16, 25–14. Not including stats from last night’s win, four Cavaliers have double-digit kills, led by junior Millie Loehr’s 24. Elizabeth Kohn and Hannah Kohn each have 14 kills, while Lauren Grosshandler has 10. Adriana Kim is the team leader with 36 assists, while Olivia Kohn has 30 assists and a team-leading 36 digs. The Cavs are right back at it this evening at Voyager Academy. The Vikings are 4–4 and winners of their last three games. The girls golf team opened the season on Tuesday with a 15-stroke loss at Wesleyan Christian. Eighth-grader Ona Lukes scored a team-best 45 in the 145–130 defeat to the Trojans. Next up will be Wednesday’s road matchup at St. Mary’s. The cross-country team opened the season with a dual meet agavs.inst Cary Christian yesterday afternoon. The results of the meet were not available prior to the deadline of this week’s Cavs Corner. We will have full results of this meet, including the cross-country season preview, in next week’s edition.